A specially formulated heavy bodied, medium setting high strength PVC solvent cement designed for joining large pipe size_ for use on schedule 40 and schedule 80 pressure pipe and fitting through 12' diameter applications include potable water, contuit server, and drain, waste and vent (DWV) systems, when used for pressure application pipe and fitting 5' diameter or larger and schedule 80 systems use of gamma G60 primer to cementing, is recommended . Temperature application range 40o- 110oE 3year shelf life. A regular bodied fast setting, high strength CPVC solvent cement formulated for jaining copper tube size and schedule 40 pipe and fitting through 2' diameter interference fit, The use of gamma G60 pimer pior to cementing is recommended CPVC pipe and fitting are specifically designed for cold and hot water systems up to 180 f. 2 Yearsw Shelf Lifet.temparature application range is o` - 110`F 3 Year Shelf Life. 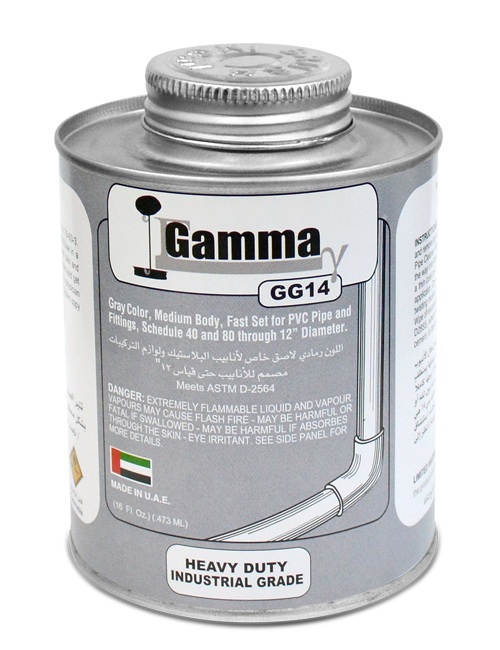 This cleaner is formulated to be used with gamma PVC, CPVC, and ABS solvent cement products. Cleaning the pipe and fitting prior to cementing always yielders better results. The cleaner should be used to remove, dirt oil, grease and other foreign material from the surface of the pipe and fitting to be cemented. This will ensure a clean joint enabling the installer to apply a uniform amount of cement for a strong tight joint. Temperature application range is oo - 110oF Unlimited Sheff life.